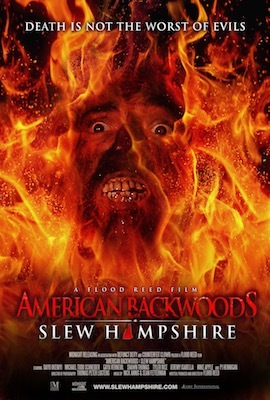 My blog post review of the horror thriller American Backwoods: Slew Hampshire. Recently I had the chance to review Dismembering Christmas, this time I had the chance to watch a screener for American Backwoods: Slew Hampshire. It’s a horror thriller that is available via DVD and Video on Demand (including iTunes) in North America, however it does not seem to be available elsewhere yet and the DVD is according to Amazon, region 1. It has a running time of about 103 mins. In June of 1994, one of the most brutal mass slaughters in history occurred in the backwoods of northern New England. Four months later, history is about to repeat itself.The end of summer signals the brink of manhood for a group of lifelong friends who proudly call New Hampshire their home. But when they embark upon a local rite of passage - traveling north for one final weekend of debauchery together - it just might prove to be their final weekend period, as this rite is doomed to go frightfully wrong.When they find themselves ensnared in a struggle for survival amongst a sinister hunting party, a bloodthirsty tribe and a mythical beast, what began as a comedy of errors devolves into an all-out Darwinian duel to the death, and less than 24 hours will pass before a slew of lives have been claimed and the last of the living remains. I think I should start off by mentioning that there is a trailer available, but it doesn’t do it justice. The trailer in my opinion makes the movie look much more low budget than it actually feels watching it. It had according to IMDb an estimated budget of $300,000 dollars. The movie feels to me to be a bit of a cross between The Hills Have Eyes and a Texas Chainsaw Massacre. It has good professional cuts, editing and a nice opening credit sequence. It sticks pretty well to the classic horror formula which is what I’m sure they were going for, including a typical or even cliche cop who's up to no good and a nutcase at a gas station, reminiscent of Ralph in the first two Friday the 13th movies. All the main characters are male, which is a bit different. Normally in movies especially in Horrors you would either have a mix of male and females or you would have an entire female cast. In fact you don’t see a main female character until about 55 minutes in. I personally would prefer it if they were female, as I think most people are going to care more about women being kidnapped, raped and murdered then they are men. I also think people are more likely to root for female characters. The only problems I have with this movie are the following and they are not major issues. I don’t feel the main characters show enough emotion, they don’t really seem to care much about anything, especially Bro.The Music can at times be a little too loud when people are talking, however the dialog is still hearable unlike in some movies. But it does have good sound quality. A scene with a women giving birth near the end went on too long. So, if you are someone who can’t stand low budget movies then maybe give this a miss, but if you are able to watch low budget movies then I recommend you at least give this a quick rent. It is better than the trailer makes it look.